Login or Register to bid in this auction. Twin naturally aspirated Ford Lehman engines provide for improved maneuverability and redundancy for safe cruising. Tens of thousands of these engines were manufactured and they are found in many different trawler designs. Parts are available through American Diesel Corporation and other suppliers. Engine instrumentation at the lower helm is functional; flybridge gauges are inoperative due to wiring corrosion. Both tachometers are functional on the flybridge. There is a 4000 watt gas powered generator stored on the flybridge. An older air cooled alternator unit is in the engine room but is not used due to overheating in use. Additionally, an older Webasto heating system furnace is in the engine room that is not operable. The ducting for this system is installed throughout the boat which would be useful for a replacement furnace installation. The hull of the Albin 36 is a solid fiberglass laminate. The fiberglass layup of the hull is substantial with 17 layers of laminates at the keel, and is generally well supported by fiberglass encased stringers, frames and plywood bulkheads securely tabbed to the hull. Construction of the decks, cabin house and flybridge utilize cored fiberglass composites. Most of these boats were sold with teak decking that led to water intrusion issues. Our boat has had these decks removed and now has fiberglass non-skid decking on all surfaces. The hull sides are a white gelcoat finish. The cabin and decks have been painted. The teak trim on the exterior is in great condition and shows well. This boat features a great deal of living space in 36 feet, with lots of windows and teak butterfly hatches to bring in light and ventilation. The boat is entered through doors on either side of the main salon. Inside, the helm is forward to starboard with a large chart table surface to port. Aft to port is the large galley with a four burner propane stove with oven, a single deep stainless steel sink, ample counter space and storage in drawers and lockers, and a Norcold refrigerator with freezer. Opposite the galley is a very large U-shaped dinette settee with high-low table that converts into a double berth. The floors are teak parquet, and there are two removable hatches for engine room access. Additional storage is found under the settee and in a corner cabinet. Forward from the salon is a private cabin with access to the anchor chain locker. There is a v-berth to sleep two in single berths and a private head compartment with shower. The compartment is heated with a Red Dot engine driven heating radiator beneath a built-in seat. There is ample storage in lockers and drawers. The private aft master suite cabin features an offset double berth, a nice teak desk space with storage, and a large head compartment with both a shower and bathtub. There's a side table as well and ample storage in hanging lockers and drawers. This space also has a Red Dot engine driven heating radiator in place. Albin Marine designed trawlers, built in Taiwan, that were known for being solid, spacious, and capable with extra tankage for an extended cruising range. Our Albin 36 Trawler is a tri-cabin model -- a roomy two stateroom layout with ensuite marine head compartments - one with a bathtub! The layout maximizes the salon as well, and features a large u-shaped settee with high-low table to seat a crowd. Most of these Albin 36 Trawlers had a single engine. Ours has two Ford Lehman 120 HP diesels aboard -- a valuable option. The teak decks are gone -- replaced with waterproof fiberglass nonskid on all surfaces. The exterior teak trim is in great condition. The navigation instrumentation is updated with Lowrance electronics including a multi-function chartplotter with broadband radar. Older systems are aboard as a backup. There's an autopilot for safety and ease of navigation. And for serious fishing, a heavy duty electric pot puller and twin Scotty digital downriggers are aboard. In the engine room some older components need replacement including a hot water heater and a Webasto diesel furnace unit. A new 4000 watt gas generator is on the flybridge to replace an older air-cooled alternator unit in the engine room that overheats but does operate. Our Albin 36 Trawler is priced to sell and competitive with single diesel variants. 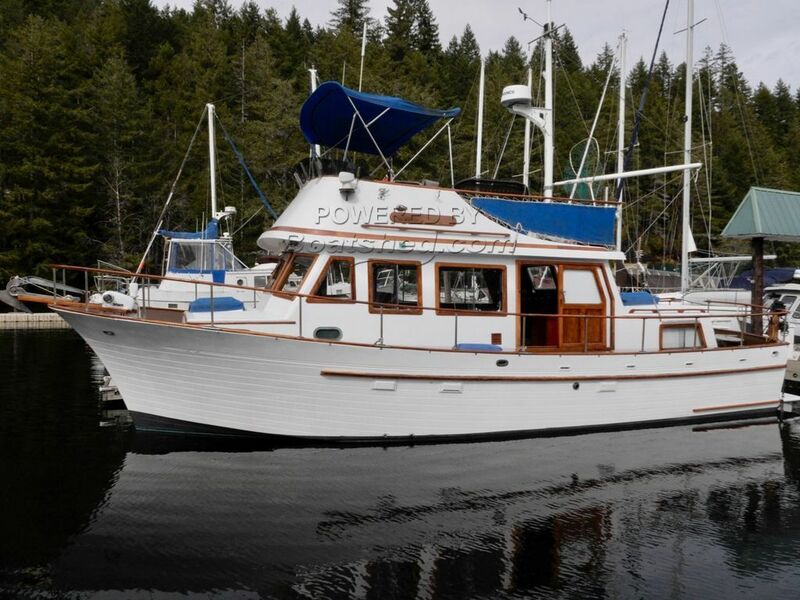 This comfortable twin diesel trawler would be a great choice for local cruising, crabbing and fishing, or an extended voyage up the Inside Passage next season. This Albin 36 Trawler Tri-cabin has been personally photographed and viewed by Brian Moratti of Boatshed Port Townsend. Click here for contact details.